Our team members raise families, build airplanes, hike the Rockies, homebrew beer, and play in bands. But despited our varied personal interests, we are united by a common purpose and passion for building amazing Web and mobile experiences. Ever feel like you don't have an agency's full attention, or you're only receiving junior-level attention? Big or small, every project matters to us, and we staff every project with senior level talent. Our cloud architects, developers, and designers have experience with companies of all sizes and types, from small solo-run projects up to 50+ member worldwide development teams. Your reputation. Your budget. Your deadline. These are critical to you, so they're critical to us. At Media Lantern, this principle guides our work every day. We strongly believe in this approach, and our customers agree: our average relationship is 5+ years. Contact us today and find out why Media Lantern's customers keep coming back for more! 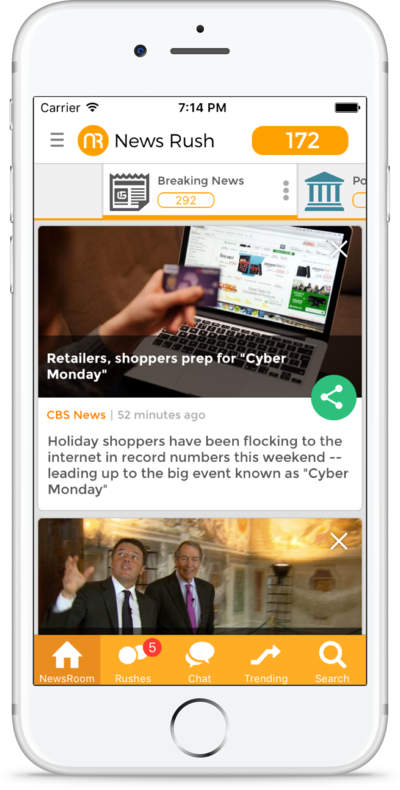 News Rush is the leading news social network, allowing users to connect and share content around mutually shared topics of interest. By adding context to the act of sharing, News Rush reduces the "noise level" commonly found in other social networks, alllowing users to focus on just those topics they want to see. Media Lantern inherited this project as a server-rendered Django application. Although the initial version was sophisticated, hosting costs were high, performance was low, and the mobile apps were clumsy to use. While Media Lantern's UX designers streamlined the mobile apps, our cloud architects rewrote the back-end in NodeJS and "serverless" techniques, yielding significant performance improvements and cost savings. The result: a better mobile experience and over 80% reduction in monthly hosting costs! 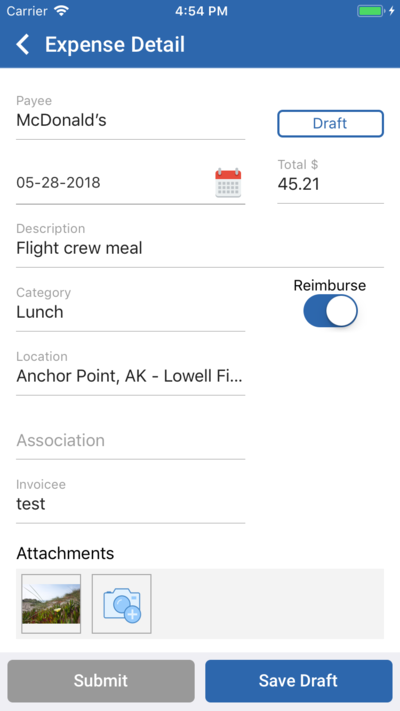 Awarnys is a specialized application for expense tracking in the charter aircraft industry. The company has a unique approach based on the founder's experience with charter airlines that makes it ideally suited to this purpose. Although Media Lantern can provide one-stop shopping with in-house designers, Web and mobile developers, and cloud architects, we are happy to partner with other firms of our customers' choosing as well. This project is an example of Media Lantern's flexibility: The project was a "rescue" collaboration, working with two other firms. Media Lantern handled the mobile app, rewriting it in React Native both to modernize it and add new functionality to match ongoing work in the Web interface. React Native allowed delivery in both iOS and Android, which was previously considered cost-prohibitive. 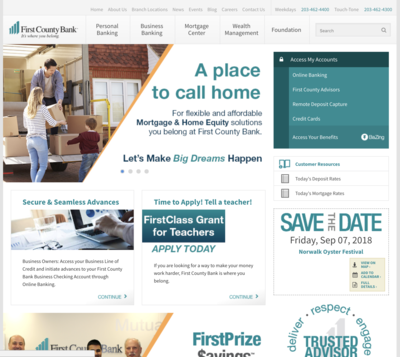 First County Bank is a 16-branch, full service financial instution in Fairfield County, CT. It is a very active community bank and as such, its Web site is not the static "brochure" many sites end up being. Instead, its marketing team is constantly publishing new events, product information, surveys, and other items to drive engagement on the site. Active editorial work on the site meant entry-level solutions such as Wordpress would not meet the Bank's needs. Media Lantern implemented a full-workflow publishing solution based on the Drupal CMS, including staging/production deployments, a palette of 15 "widgets" to support building pages, WYSIWYG editorial tools, and integration with third party tools such as form management and mortgage services. Media Lantern has also assisted the Bank with 3 design refreshes over the years to help keep the site itself up to date and modern in its look and feel. Atlantic Data Security has provided best-in-class security solutions since 1993. The company's employees are engineers with deep technical backgrounds, a case where it is often tempting to make Web sites "DIY" projects using internal resources. 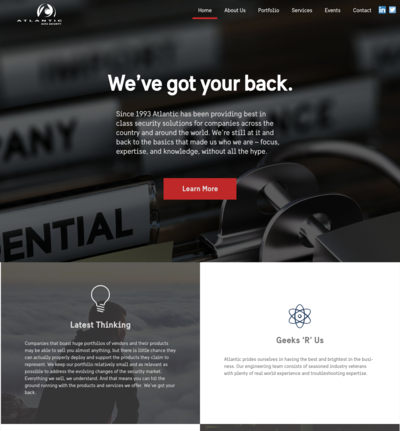 However, recognizing that building its own Web site was a distraction from the company's core mission, they chose to leverage Media Lantern to to support upcoming marketing efforts on a short timeline. Media Lantern believes there is no "one size fits all" solution when it comes to software engineering. Although we often recommend Drupal for heavy-duty CMS work, in this case Wordpress was a much better choice. Its streamlined interface matched Atlantic Data Security's need for easily posting updates about upcoming events, allowing the company to self-maintain the site once it was completed. 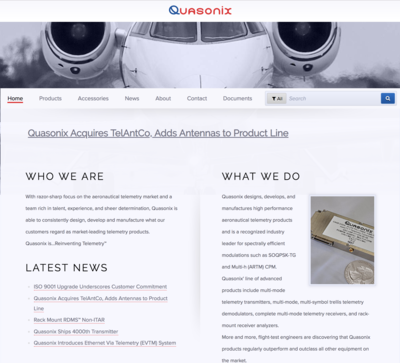 Quasonix manufactures radio telemetry transmitters, receivers, and modulators. Military and commercial organizations often have special needs not met by off-the-shelf solutions, and the Quasonix product line is highly configurable. However, this also means their products are not easily described through simple brochure and product description pages. Quasonix resellers have a tool that allows them to create specialized price quotes via a Web interface. Systems integration is a particular specialty for Media Lantern, and this project is a good example of this work. The core product specification formulas are held in actively-maintain Excel workbooks that would not make sense to duplicate in "Web code". Instead, the Web site bridges directly to Excel, "running" the spreadsheet and then producing formatted PDF price quotes for customers. Live video streaming is a competitive space, but there are still niches in which a startupn can establish differentiation and unique value. 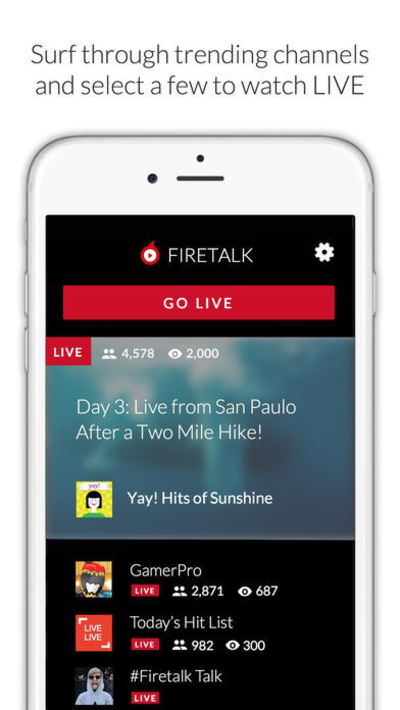 Firetalk's focus was on entertainers: musicians, performers, actors, and other celebrities who want to reach out to and interact with fans but in a more personalized manner than Youtube or other venues allow. Although the product has now been retired (it was an experiment) it represents a truly soup-to-nuts approach to application development, including graphic design, Web, mobile (iOS and Android), API, back-end processing, reporting, marketing, realtime live-chat, RTMP, HLS, and MPEG-DASH video, and many other components. Media Lantern's experience with other entertainment-industry sites and apps was a huge asset in this effort. Copyright © 2018, Media Lantern, Inc. All Rights Reserved.